Knowledge, at the recent Liebherr 2018 World Team Championships in Halmstad, that commodity was present in force; in conjunction with the International Table Tennis Federation, the European Table Tennis Union seized the opportunity. Organised by Professor Neven Cegnar, the ETTU Development Manager, a Women’s Coaches seminar was staged from Sunday 6th to Tuesday 8th May; impressively 20 coaches from 15 national associations attended. Former European champion, the host nation’s Li Fen assisted by Austrian national coach, Liu Yan Jun addressed the subject of footwork; Peter Sartz, Swedish National Coach, presented the topic of passive play. Both theory and practical sessions were held. 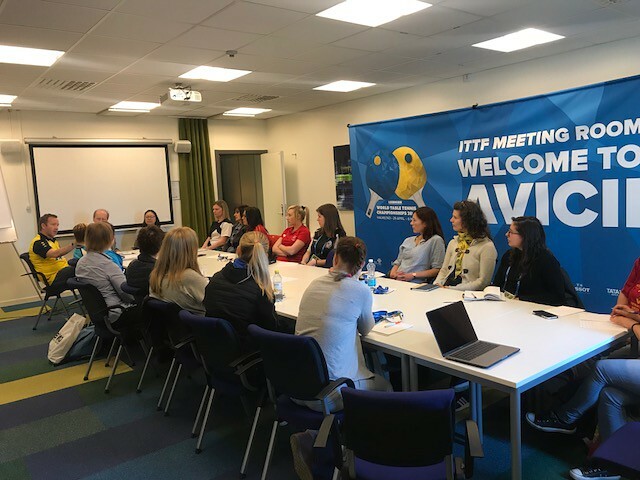 The coaches who attended were: Nina Kolarova (Belgium), Iveta Vacenovska (Czech Republic), Ahn Pedersen (Denmark), Henrietta Nilsen (Denmark), Svetlana Kirichenko (Finland), Vasilika Fragou (Greece), Audur Tinna Adalbjarnardottir (Iceland), Laura Pavare (Latvia), Laura Krumina (Latvia), Lina Sabaliauskiene (Lithuania), Marte Grutle Aasebo (Norway), Maria Nogueira (Portugal), Nada Banjac (Serbia), Veronica Pastrana (Spain), Laura Perez (spain), Nauria Castro (Spain), Nauira Caballero (Spain), Almudena Roldan (Spain), Jessica Larsson (Sweden) and Charlotte Carey (Wales).